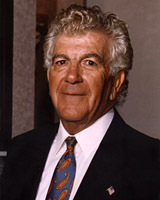 John S. Dennis, Chairman of HED International, Inc. was honored as an American Ceramic Society Fellow at the 107th Annual Meeting Awards Banquet in Baltimore, Maryland, April 2005. Holder of a B.S. in Ceramic Engineering from Alfred University, an M.S. in Ceramics and Ph.D. to the dissertation from Rutgers, an Honored Ph.D. from Florida and a pilotÕs license, instrument certified from the FAA. Previously employed as President of HED International, Inc. (1980-2000); Vice President of The American General Energy Corporation (1973-1980); Vice President of The Research and Development Products Co. (1962-1973); Technical Director of United Clay Mines Corporation (1957-1962). Holder of several of U.S. and foreign patents for thermal material and process equipment; Speaker and author/coauthor of papers for the American Ceramic Society, Canadian Ceramic Association, Society of Glass and Ceramic Decorators, Ceramic Association of New Jersey, Pennsylvania Ceramic Association at Penn State University, and Rutgers University Seminars Program. Recipient of the Sylvania Fellowship Alfred University, ÒOutstanding Young Men of American Award,Ó Ceramic Association of New Jersey Annual Award, Medal of Merit Award by President Ronald Reagan, Past Member of NICE and The Keramos Honor Society. Since 1957, a member of the American Ceramic Society, presently Emeritus, with Trenton Section of ACERS, and affiliated with the Material and Equipment Division. For more information about the American Ceramic Society Awards Banquet click here.